Gifts certificates for horseback trail rides and for the store are available at New Creations Farm Store. See Tonia for details and to purchase them. 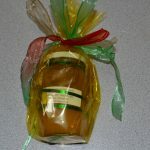 We have a large selection of organic canned goods as seen on our canned good page under Farm Products. Now is the time to think about giving organic canned goods as a gift for Christmas. We have some already wrapped up and ready for your Christmas giving. We can also wrap up special orders. Some of the wrapped ones will be available at Fork’s Farm Market on Nov 20th and Dec 22nd, 2018. You can also place an order for us to bring to the market. Gift baskets are also available. 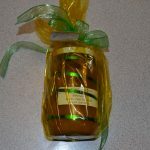 We can make up special order gift baskets. Examples would be a basket full of hot items, basket full of jams n jellies, or a basket full of relishes. 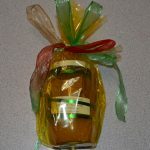 Gift certificates for canned goods are available also and can be purchased alone or with a gift basket. Gift baskets are $25.00 and up. 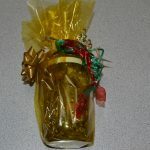 All sizes of canned goods will be normal price plus $1.00 each for the wrapping and name tag on each jar. For larger orders we can give you a bit of a discount. Please message us at jomm777@gmail.com with any special orders that you would like pricing on. There are also discounts for case orders of the same or mixed items.